This week, let’s examine a pair of posters that regular visitors to the Republic’s Carrick Station or any player of Huttball will surely recognize. The orange banner is another travel poster, this time for an interstellar transport firm called DGB. The meaning of the initials and the numbers along side them are unknown to me. The second poster with its delightfully Eighties contrasting blue and pink color scheme advertises a galactic marketplace. I can only speculate on the meaning of the large letter Besh: Balmorra? Bespin? Buy n Large? The Mern or M letter, however, is a common element on some other marketplace posters. I’ve speculated on its specific meaning before, and see no reason to stop now. 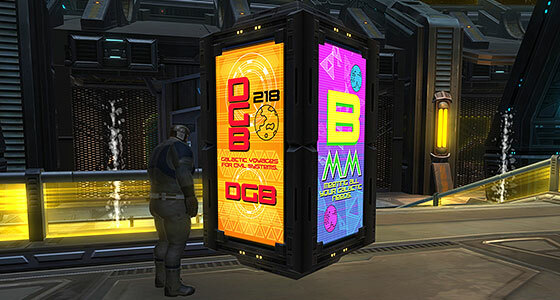 The double Ms could very well stand for the Migrant Merchants Guild, which seized control of Coruscant’s Old Galactic Marketplace. Both posters use design elements seen elsewhere in the game. 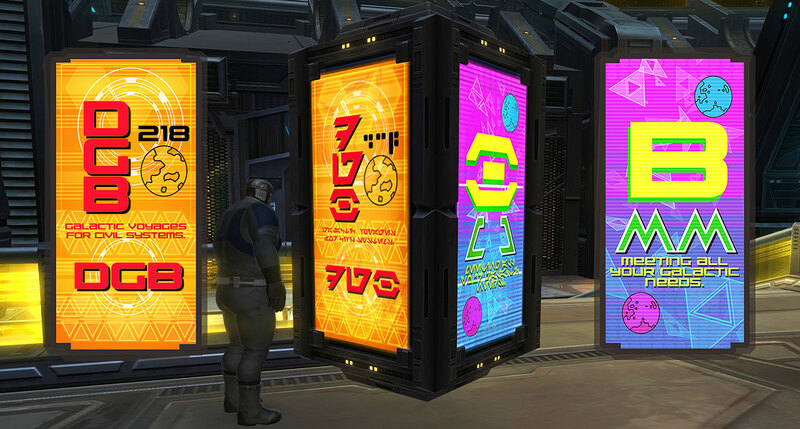 The triangular “triforce” symbol and the connected hexagons are often seen on their own in any neon-soaked location from the Huttball arena to Nar Shaddaa’s Promendade. It seems that even in a galaxy far, far away corporate branding is as inescapable, as it is in our own. Comments Off on Shop Together. Happy Together.